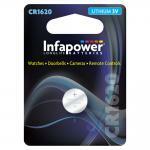 Infapower's CR1620 lithium coin cell. 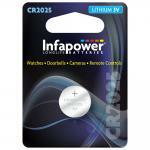 Ideal for watches, doorbells, cameras, remote controls etc. Features - Included cells: CR1620 - Cell capacity: 3v - Lithium coin cell - Ideal for watches, doorbells, cameras, remote controls etc.Important: Due to the current restrictions on Lithium Batteries imposed by Royal Mail, products of this type can only be shipped by courier. Please contact our customer support department for carriage pricing.